Navajo code talker Allen Dale June, of Longmont, takes in the festivities at the Avondale/Boone and Eastern Pueblo County Veterans Day parade Saturday. June, a Marine veteran, is one of two surviving Code Talkers from WW-II. AVONDALE - World War II veteran Allen Dale June's wife refers to him as "an endangered species." Those who honored the former Marine on Saturday refer to him as a hero. June, a member of the Navajo tribe, was honored at the annual Avondale/Boone and Eastern Pueblo County Veterans Day parade parade for his service during World War II as a Marine Code Talker. At 84, June is one of the two survivors among the 29 original Navajo Code Talkers. He and Virginia now live in Longmont. Pacific during the war. The Navajos were recruited to develop a language, based on their native tongue, that the Japanese could not understand. 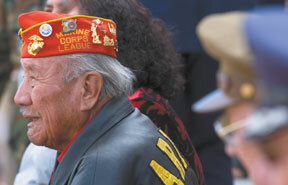 The code talkers were featured in the 2002 movie "Windtalkers." June was 16 when a recruiter came to the Navajo reservation in Arizona seeking potential Code Talkers. Mrs. June said, "They told him he had to get his parents to sign for him. He took a piece of paper, wrote his dad's name on it and returned it to them. They selected him and off he went." June was among 35 Navajos selected for the job. Twenty-nine made it through boot camp. After a few months of training, June was transported to the Pacific rim, where he was involved in seven major battles and crossed the equator eight times. June, wearing a leather Marine Corps jacket and red hat, downplayed his role in the war. "They asked me to do it and I did it." Mrs. June said her husband's role in the war has gone virtually unnoticed until just a few years ago. In 2001, President Bush honored the then-four surviving Code Talkers in a celebration in Washington, D.C. At that time, he also awarded the men a Congressional gold medal. 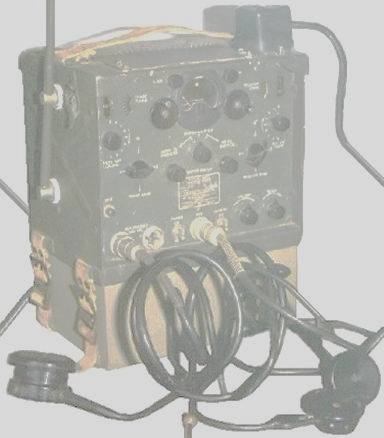 A year later, "Windtalkers" was released and the Code Talkers received more recognition. "He really did a lot of remarkable things," said Mrs. June. "It's a shame that it's taken this long for these men to be recognized." She said she and her husband were honored to have been asked to participate in Avondale's veteran's activities. "We thank you for honoring our family and the Navajo nation," she said. "This is a reflection of your generosity and love for those throughout the world."